Info "Rebuild the first face you see." Puzzled Face is one of The Job Center microgames in WarioWare: D.I.Y. 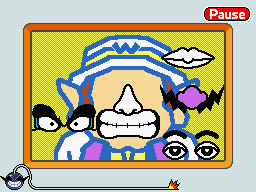 The player has to draw arts for Wario's face parts. The game starts with Wario's face with random face parts. To win, the players have to remake the starting face. To do so, they have to tap face parts needed to remake it. If done so, the game is won. However, if the face that the players made doesn't match the starting one or if time's up and the face is still not ready, they lose the game. "In this game, you have to remember the starting face, then try to make it again! Draw face parts...that don't look like mine!" This page was last edited on July 18, 2018, at 22:39.